While great products and excellent customer service can keep customers coming back, your visuals and branding are going to be the elements that get people to walk into your shop in the first place. Your store’s window display plays a big part in this, which is why you should take the steps to make it as fresh and attention-grabbing as possible. Before you bring out your craft supplies, fixtures, and whatnot, take some time to think about your target audience. Who do you want to attract? What types of people would benefit most from your products and services? Let the answers to these questions guide your decisions. Your window display needs to be targeted enough to entice the right shoppers, but not too specific that it’ll alienate potential customers. This is something that Sessions Music, a music education company learned. According to its marketing director Adam Williamson, since 75% of their students were under the age of 15, they initially stuck with “child-centric” imagery in their displays. They soon realized, however, that this alienated and misled potential customers into thinking that Session Music was just for kids. “Even after we changed this, we still constantly had people saying ‘Do you have programs for adults?’ Of course, we do but our window displays did not properly showcase that,” Adam said. Aside from considering your target audience, you also need to think about their perspective, advised Sophie Darling, the community manager at WeddingDresses.com and a former bridal shop owner. “What do you want them to look at? Where do you want them to look first? How can you draw them in closer? Usually, this means putting your prime item right at eye level,” she added. Check out this window display from Christian Louboutin, and notice how they elevated certain products (i.e., the purse and shoes) so that they’re either at or close to eye level. Do the same thing with your windows. Identify the key products or elements of your display and position them at eye level to draw people’s attention. You also want to make sure that the products are big enough to catch shoppers’ eyes. On top of thinking about who your target customers are, also be sure to consider their mindset, actions, and behavior when they’re in the vicinity. Is your store in a shopping center where people can leisurely walk around, or are you in a fast-paced environment? Will they be with their kids or shopping alone? Will people be on foot when they see your displays or will they be in their cars? Think about how much time people have when they stroll, stride, or drive by your store, then design your window displays accordingly. For instance, at Sessions Music, they make it a point to limit the use of text in their displays because they know that a lot of their customers only have a few seconds to look at their window. “We realized that many people who see our window displays were in their car. If our message was not clear to someone who has 1-3 seconds to view it (not nearly enough time to read anything), then we would not run with it,” said Williamson. Stories, whether they’re read, heard, or in this case, seen, are far more effective in grabbing and keeping people’s attention. In other words, stories stick. This is true for speeches, articles, and yes, even window displays. Your displays should go beyond showing off your products; they should tell tales that pique shoppers’ interest and encourage them to come inside. You can do this by selecting a theme, and finding stories in line with it. Check out what Anthropologie is doing. The apparel retailer changes the window displays of its stores depending on certain seasons or events. What makes their window displays great though, is that Anthropologie always finds a unique angle or story within its chosen season theme. We just have one caveat when it comes to storytelling based on themes: Don’t to fall into the trap of using clichés. For instance, when Halloween rolls around, it might be tempting to fill your display with pumpkins or ghouls. This might be a bit superficial. Find ways to go a bit off the beaten path and come up with something unique. Consider what Cole Hardware in San Francisco did. Instead of going for the cliched “Happy Halloween” route that’s filled with ghosts and Jack-o-Lanterns, it used the holiday to show off its broom selection and cleaning products while telling a Halloween tale at the same time. Sophie echoed this advice, saying that cluttering up a window display is one of the biggest mistakes that retailers can make. You’ll be changing your window display regularly, so devote ample resources on the materials and equipment that you’ll be re-using. This could include frames, fixtures, lights, mannequins, and more. Also be sure to invest in the storage materials for your fixtures and window display equipment. Doing so enables them to re-use their materials, saving them money and planning time. Inspiration is everywhere — just ask Laura Watkins, the owner of Pink Pointes Dancewear, a UK-based dance shop. “I get inspiration from a range of sources, the season, a film or song, a product we want to showcase or if I’m feeling really stuck Pinterest boards are helpful too,” says. As an example, Laura shared how she once used autumn to inspire her display. Laura said the display was such a hit that shoppers came in the store just to compliment it. Williamson also advises retailers to keep their window displays up-to-date and relevant. “It may seem quite burdensome and expensive to constantly be changing window displays but their effectiveness is directly correlated to their relevance to your current promotions, the season, the weather, and so on,” he says. At their store, he shares that they change their window displays at least once a month; and during busy seasons such as the holidays, they do so every week. “For me, that’s long enough that I have time to research how I am going to do something and buy extra props I’ll need,” she added. Instagram – This social networking app is a goldmine for retail ideas. Searching for hashtags like #windowdisplay, #shopfront, and #retaildesign will bring up photos of what other retailers are doing and inspire your efforts. And don’t forget to follow the retail-centric Instagram accounts dedicated to storefront design. Pinterest – As Laura mentioned, Pinterest is another great source. A quick search for “window displays” will return tons of pins and boards that you can peruse for ideas. Be sure to pin, like, or follow the good ones (such as Vend’s Beautiful Window Displays board) so you can always come back to them when you need to. Retail Design Blog – This is a site that aims to assist retailers and visual merchandisers by providing news about the latest design trends and by presenting interesting projects and designs. design:retail – Another great source for inspiration, design:retail covers retail design news and trends, and showcases layouts, designs, and displays from other retail stores. Having a great-looking window, is great but you want to balance your aesthetic with an analytics strategy so you can keep creating winning displays. To do that, analyze your customer data. Measure your foot traffic to see which displays are drawing in visitors then figure out if they’re converting. If they are, says Marcm then drill down on what makes a display effective. Once you’ve gathered your insights, share them with your staff in other stores and districts so they can implement your findings. 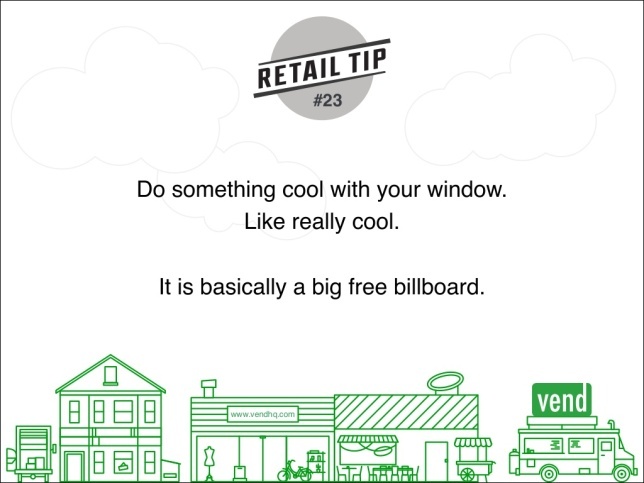 Like we said in our Retail Tips Generator, your window is basically a big free billboard that you have full control over. Be sure to do something really cool with it, and make it count. How do you keep your window displays fresh and compelling? Tell us–or better yet–show us by leaving a link in the comments or by tweeting pics of your window displays @vendhq.